During February 2004, a salvage excavation was conducted in the center of Kafr Yasif, near the southern side of the hallowed compound named for A-Nabi Al-Hader (the prophet Elijah; Permit No. A-4096; map ref. 21584–8/76190–6), after a bulldozer damaged archaeological remains. The excavation, undertaken on behalf of the Israel Antiquities Authority and underwritten by the contractor, was directed by R. Abu Raya, with the assistance of Y. Ya’aqobi (administration), H. Tahan (drawing), Y. Gorin-Rosen (glass) and D. Syon (numismatics). 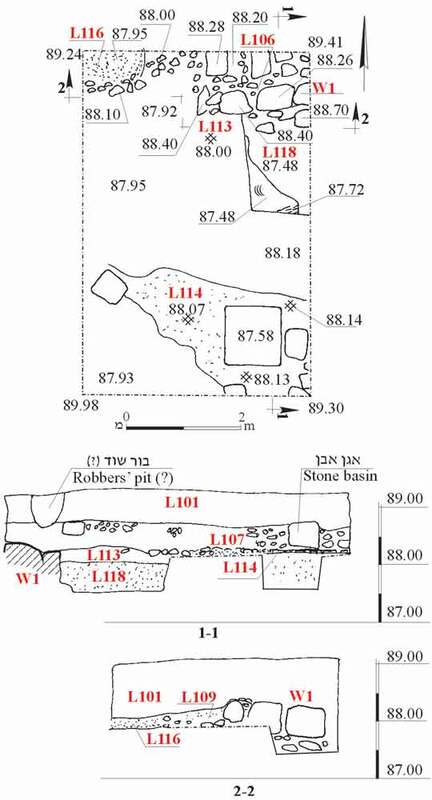 One excavation square (4×6 m; Fig 1) was opened and a section of a wall (W1; 1.1×2.0 m, preserved height 0.8 m), aligned east–west, was exposed. A single course, composed of two rows of medium and large hewn stones and ashlar stones in secondary use, was preserved (max. dimensions: 0.4×0.5×0.6 m), with small and medium fieldstones placed between them. This course was set on a foundation of indigenous fieldstones, placed on bedrock. A hoard of Byzantine coins from the sixth century CE (L106; below, Nos. 1–6) was discovered within the wall. The southern side of the wall was abutted by an earthen floor (L113), founded on a deposit of well-tamped earth (L118; thickness c. 0.5 m) that was set on virgin soil. A section of another crushed chalk pavement (L114) was exposed in the southern part of the excavation square and its level corresponded to that of Floor 113. These two sections of floor were overlain with a layer of fill (L107; thickness 0.4 m), which contained burnt remains that were visible in part of the square. An assemblage of pottery vessels that is characteristic of the latter part of the Byzantine period, the Umayyad period and possibly the beginning of the Abbasid period (sixth–eighth centuries CE) was found on Floor 113 and in the overlying fill. These included LRC bowls (Fig. 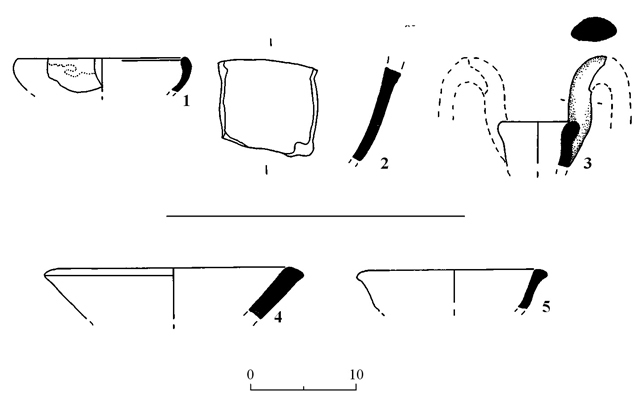 2:1–4), a closed cooking pot (Fig. 2:5) and an imported amphora (Fig. 2:6) from the Byzantine period, and kraters (Fig. 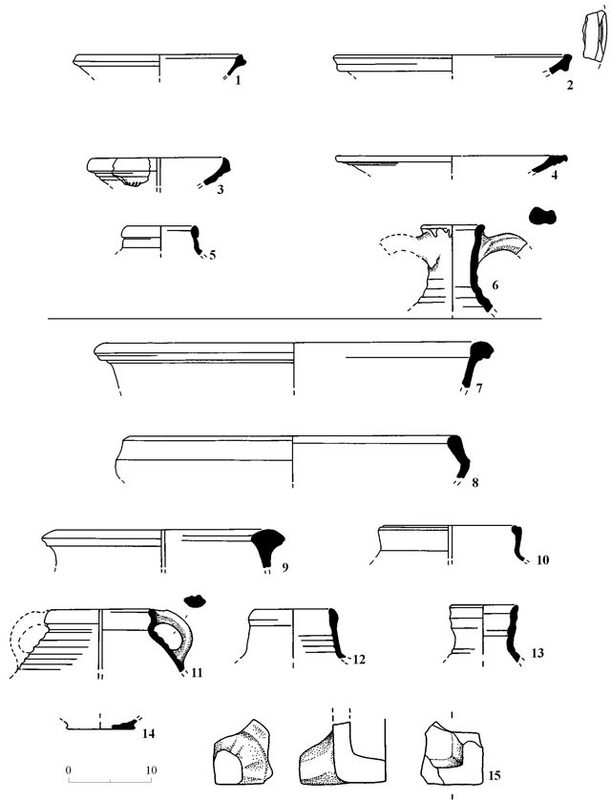 2:7–9), closed cooking pots (Fig. 2:10, 11), jars (Fig. 2:12, 13) and a flat base of a buff-ware jug (Fig. 2:14) from the Umayyad period or maybe even the beginning of the Abbasid period. Other finds included glass vessels that dated to the end of the Byzantine period and the beginning of the Umayyad period (see below) and two Umayyad coins that were found in the burnt layer above Floor 113 (below, Nos. 7, 8), which also contained the corner of a square stone basin with feet (Fig. 2:15; see Fig. 1). It therefore seems that the room abutting W1, which was constructed in the Byzantine period, existed until the end of the Umayyad period or possibly even into the beginning of the Abbasid period. A section of a tabun (L116; min. dimensions c. 0.6×0.8 m), exposed west of W1, was probably built after the wall was destroyed. The tabun contained a few potsherds, including a rim of a green glazed bowl (Fig. 3:1) from the Crusader period (thirteenth century CE). The remains of the tabun were covered with an accumulation of brownish gray soil fill (L109; thickness c. 0.5 m) that included small and medium fieldstones. A mixed assemblage of potsherds and glass vessels that dated from the Byzantine until the Mamluk periods was found in this fill. The finds from the Crusader and Mamluk periods, which apparently belonged to the later phase of the site, were found in the topsoil (L101), mixed with earlier assemblages, into which they intruded due to robbers’ pits. These included a fragment of a bowl decorated with a Proto-Majolica-type pattern (Fig. 3:2), and an amphora rim with a handle (Fig. 3:3) that dated to the thirteenth century CE, as well as bowls and cooking pots from the Mamluk period (thirteenth–fifteenth centuries CE), among them a handmade bowl (Fig. 3:4) and an open cooking pot, glazed on the interior, which is characteristic of the end of the period (Fig. 3:5). Other finds in the topsoil included a section of an industrial mosaic floor that was not in situ (tesserae dimensions: c. 2×2 cm) and two coins, one Crusader (end of the twelfth century CE; below No. 9) and the other—Mamluk (end of the thirteenth century CE; below No. 10). A burial cave (Fig. 4) was documented east of the excavation square; its ceiling and western side were mostly destroyed as a result of the bulldozer damage. The cave, which was hewn in fractured nari bedrock, consisted of a central chamber (c. 3.0×5.5 m, min. height 1.2 m) that contained three arcosolia (width of opening c. 2. 0 m) with plaster remains on their sides and ceilings. The two long sides of the southern arcosolium had narrow shelves (width 8 cm) that were hewn 0.8 m below the ceiling and were probably used to support wooden planks that partitioned the arcosolium into two. This division suggests that the floor of the arcosolium—and perhaps the floor of the entire cave—was located c. 0.8 m below the shelf and at a depth of c. 1.6 m below the ceiling, so that the arcosolium was divided vertically into two equal burial troughs. One hundred and eleven glass fragments were found in the excavation, fifty of which could be identified; all these were dated to the end of the Byzantine and the beginning of the Umayyad periods (end of the sixth–seventh centuries CE). Most of the glass finds were discovered in the upper loci, but vessels were also found in the accumulation on Floor 113. The finds included wine goblets with a solid base and a cylindrical stem; wine goblets with a rounded and inverted rim; bowl-shaped oil lamps with a solid cylindrical base that is made in sections; and rims of plain bottles and necks that are decorated with a broad wavy trail or thin trails. Besides the vessel fragments three lumps of raw, greenish-blue and greenish-yellow glass and two fragments of apparently blowing waste were found (in Loci 107, 113). The glass industrial remains from a glass workshop in Kafr Yasif, which is known from previous excavations at the site, were ascribed to the Roman and Byzantine periods (IEJ 14:287–288; 16:284). If the industrial debris from this excavation is to be dated to the time of the vessels found with it—the end of the Byzantine and the Umayyad periods—then the workshop that had existed at the site or nearby continued to operate in the Umayyad period as well. 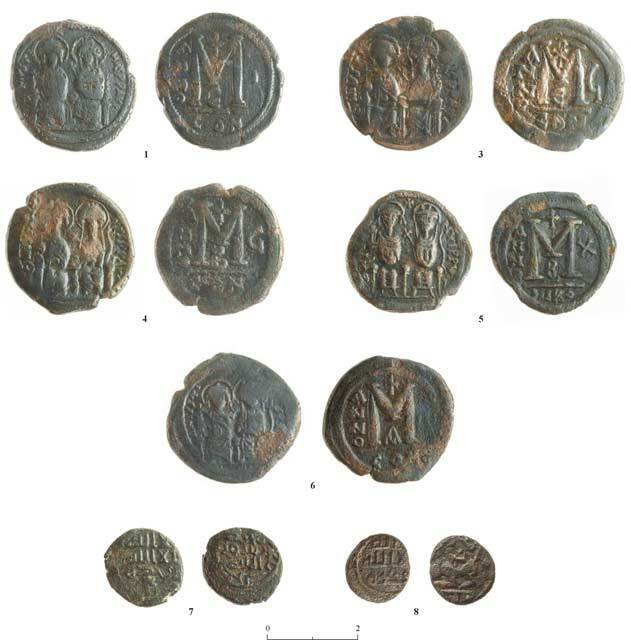 Ten of the eleven coins recovered from the excavation were identified. The six earliest coins (Nos. 1–6) belong to a hoard that was concealed in W1; all of them were minted during the reign of the Byzantine emperor Justin II (565–578 CE). The other four consisted of two Umayyad coins (Nos. 7, 8; eighth century CE), a French feudal coin from the Crusader period (No. 9) and a Mamluk coin that was minted shortly after the end of the Crusader rule in the country (No. 10). 1. Basket 1030, Locus 106, IAA 106177. Justinus II, Constantinople, 565/6 CE. Obv. DN IVSTI-NVS PPAVC Justinus and Sophia facing, on a throne. The emperor holds a globus cruciger; the empress has a cruciform scepter. Æ, follis, 7, 14.41 gr., 28×31 mm. MIB 2, Justinus II, No. 43a. 2. Basket 1027, Locus 106, IAA 106178. Justinus II, Constantinople, 568/9 CE. Obv. [---] Justinus and Sophia facing, on a throne. The emperor holds a globus cruciger, the empress has a cruciform scepter. Æ, half-follis, ↓, 7.83 gr., 24 mm. MIB 2, Justinus II, No. 44c. Justinus II, Constantinople, 570/1 CE. Obv. ON IVSTI-NVS PPAVC Justinus and Sophia facing, on a throne. The emperor holds a globus cruciger; the empress has a cruciform scepter. Æ, follis, ↓, 14.43 gr., 30 mm. MIB 2, Justinus II, No. 43d. 4. Basket 1022, Locus 106, IAA 106180. Æ, follis, ↓, 12.72 gr., 29 mm. 5. Basket 1023, Locus 106, IAA 106181. Justinus II, Nicodemia, 574/5 CE. Obv. (sic!) ON [IVSTI]–NVS PPVC Justinus and Sophia facing, on a throne. The emperor holds a globus cruciger; the empress has a cruciform scepter. A cross is in between them. Æ, follis, ↓, 11.11 gr., 28 mm. MIB 2, Justinus II, No. 46b. 6. Basket 1028, Locus 106, IAA 106182. Justinus II (565–578 CE), Constantinople. Obv. DN IVSTI– [N]VS PP[AVC] Justinus and Sophia facing, on a throne. The emperor holds a globus cruciger; the empress has a cruciform scepter. Æ, follis, ↓, 12.33 gr., 28×30 mm. MIB 2, Justinus II, No. 43. 7. Basket 1019, Locus 104 (consolidated with 107), IAA 106183. Umayyad anon. (post-reform), Tiberias, 700–750 CE. Æ, fals, 9, 3.42 gr., 19 mm. 8. Basket 1015, Locus 103/104 (consolidated with L107), IAA 106184. Umayyad anon. (post-reform), Tiberias, c.120 AH (740 CE). Rev.محمد [رسول] الله a lion kneels to the left. Æ, fals, ↑, 2.96 gr., 16 mm. 9. Basket 1007, Locus 101, IAA 106185. Hugo III (1162–1193 CE), Dijon (France). Obv. HVGO DVX BVRG¦DIЄ + a cross with rounded ends: Quadrant 1: circle; Quadrant 4: a five-pointed hat. Rev. DIVIONЄN[¼IS] cross. Quadrants 2, 3: dots. Silver slag, dinar 7, 0.69 gr., 17 mm. 10. Basket 1004, Locus 101, IAA 106186. Al-Mansur Hossam Al-Din Lajin (1296–1299 CE), Damascus. Rev. لاجين ضرب بدمشق circle divided in thirds. Æ, fals, 1.23 gr., 18 mm. Balog 1964: 131, No. 166. 1. The excavation square, plan and sections. 2. The Byzantine and Umayyad–Abbasid periods, pottery and a stone artifact. 3. The Crusader and Mamluk periods, pottery. 4. 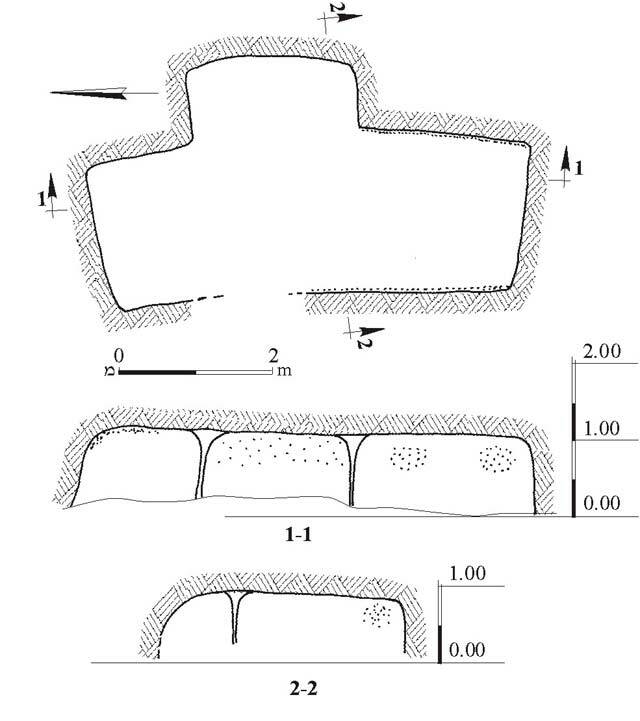 Burial cave, plan and sections.